During the 2016 BET Awards in Los Angeles, Desiigner performed his hit single, "Panda." In true Desiigner fashion, the Brooklyn rapper ventured out into the crowd, doing dance moves resembling convulsions, dabbing hard, and making intense faces. 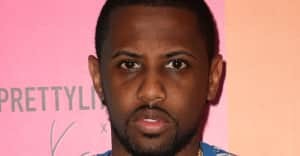 Fabolous was not impressed by the young rapper, and the moment was immortalized into a meme. View Twitter's best reactions to Desiigner and Fabolous' interaction below. Desiigner's debut mixtape New English is out now. Read: 11 Experts Weigh In: Is "Panda" Actually Good?